I’ve wanted to make an oatmeal milk bar for a long time—they’re one of the quintessential bars of soap. Mild, classic, and comforting. So I finally got around to making one… and the strangest thing happened overnight. It turned bright red. I have absolutely no idea why. I used my cheater’s way of doing a milk base; I added powdered milk powder at trace, along with the white kaolin clay (I blitzed everything together in a coffee grinder to break up lumps). I added two different textures of rolled oats; one finely ground, and the other roughly chopped (a coffee grinder comes in handy here as well). The essential oils are lavender and cinnamon. They seemed like the perfect pairing for an oatmeal milk bar; calming and warm, with a hint of spice. Like a cross between an oatmeal cookie and an oatmeal bath. Mmm. And all went well—the soap was creamy and beige when I poured it. And somehow, as it saponified, it turned a bright, beautiful red. How strange, yet beautiful. Unsure about how to use SoapCalc? I made a video to walk you through it! Please ensure you’re familiar with standard soap making procedure before diving in. 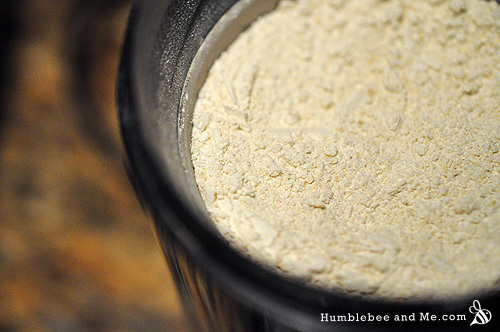 Once you reach trace, blend in the essential oils, clay, blitzed oats, and milk powder with your immersion blender. 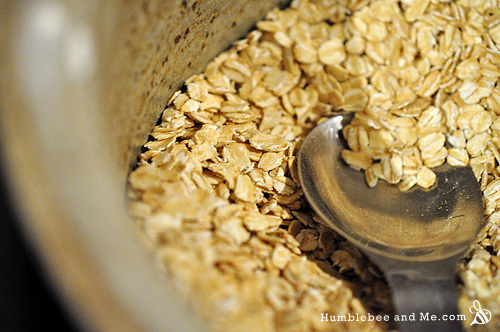 Once that’s smooth, stir in the chopped oats. Pour the soap into your mould, insulate it, and let the soap saponify for 24 hours before slicing (it should turn red as it saponifies!). Let cure for a minimum of three weeks before using. Enjoy! Sounds divine! Do you make up all your recipes yourself? Or did you start with a book of recipes or a basic recipe from a book or online and then gradually start adding your own variations? I started out by reading up on what different oils do in soaps. I learned about the four different categories of oils (lather, hardening, moisturizing, and castor oil), and the recommended percentages of each of the oils. Then I pretty much went from there, experimenting as I went. The soap calculator I use (linked on the resources page) includes numeric ratings for lather, hardness, moisturizing, etc. as well as target ranges whenever you calculate a recipe, so I’ll also run different combinations through there and see what happens to those numbers. That’s pretty much it! No recipes for me. I do wish we knew why it turned red, but it’s the perfect color for the cinnamon oatmeal! ‘Tis beautiful indeed! I know, right? It’s a total mystery! I wish I’d taken a photo of the raw soap so I could show a good before and after—with the milk & oats I was really expecting a nice, creamy bar 😛 But I do just love the red… here’s hoping I can duplicate the effect! How interesting! Thank you so much for sharing—it’s nice to know we’re still getting consistent results here 😛 Thanks so much for reading and DIYing with me! It will be my next soap to make!!! and I HOPE it also will turn red… it’s so beautiful and bright!!! I’m going to guess that your soap reached “full gel” and that’s why the intense, clear colour, but why it started out creamy and turned red I don’t know. this forum http://www.soapmakingforum.com has been a source of interesting soap information so maybe if you asked there you’d get some suggestions? Ha, thanks for pointing this out, Dawn! It’s good to know I’m not alone in my mystery red oatmeal soap 😛 And thanks for the resource suggestion, I’ll be sure to check it out 🙂 Maybe one of the sleuths there will have an answer for me! That sounds like a great method to me! I am really psyched to try a recipe for guiness stout soap I found in a book (I think I already told you that!). I have my favorite essential oils so it makes sense to experiment. I would love to come up with a Vanilla Chai Tea soap. Yummmy! A lot of the soaps I want to make will smell like food. I love baking smells….and tea. I’m just dying to make beer soap as well! The problem is that I always drink the beer before I can turn it into soap, lol. I’d also be really interested to try some red wine soap… oooh… just thought of that, actually, onto the to-do list it goes! I think I’ve made chai soap before… if not, I know several different chai-blend soaps are on my soaping to-do list 😛 I love the scent of chai! And gingerbread… I’ve also made soap using tea as a base before, though it seems to be more of a “sounds cool” thing than a “major benefits to the final product” thing. Oh well, gotta try new things! You mention you added powdered milk. How much powdered milk did you add for this recipe? I am trying to replicate it to see it turn red as well. I’ve got all ingredients except for the milk. I wonder if I omit it, if it would still turn red. I didn’t have milk powder on hand so I didn’t add it. And I used collodial oatmeal from NewDirections instead of grinding grocery store bought oatmeal. I’ll let it sit for another 24 hours and report back if it turns red at all. So right now, it might be the milk powder and/or the oatmeal that makes this recipe red. Hmm… how interesting! Thank you for helping me out with the testing process! Did you insulate your mold well? Is there a chance the soap didn’t reach full gel and mine did? That could be another reason. Also, which cinnamon essential oil did you use? I know there are a few different kinds, so we might have used different types (I used Cinnamomun cassia blume). Hmmm… the mystery continues! I didn’t insulate my mold, actually I never do… but I can tell it reached the gel stage. The ‘ring’ in the middle occurred and eventually evened out the colour after it cooled. Except it’s the creamy colour. I also cut back on my EO blend of lavender and cinnamon bark. I only used 2/3 in proportion with the weight. I felt the scent was already strong (the cinnamon masked the lavender even though it’s only 1 part to every 2 parts of the lavender). I want to try this again with the milk powder. Is it whole milk powder or skim? I got all my ingredients from NewDirections (I live in Toronto) – except for the lard which I picked up from The Healthy Butcher. What about the oatmeal? Is it the regular store bought quick oats oatmeal? The red colour is absolutely gorgeous! And I think it should be red, since the scent reminds me of cinnamon hearts. Yup, same cinnamon EO. You can’t really smell the lavender in mine, I just used it to soften out the cinnamon scent, and it does that. I used whole milk powder, I got it at my local health food store. The oats are definitely just the oats from the store, the same ones I eat for breakfast! I’m out of cinnamon EO right now, but when I get more, I am definitely trying again to see if I can duplicate my results—I’m super curious, too! I used to live in Toronto—I think I visited the Healthy Butcher at least once. The St. Lawrence Market and the shops around Trinity Bellwoods were my favourite spots 🙂 I miss all the awesome, delicious foods I could get there! Have you ever visited The Spice Traders? They have the best black pepper! I’d love to try this, and love the color! Do you happen to know if your cinnamon eo was steam distilled or a co2 extract? Did you ever find out what made it turn red? Hey, Yvonne! I haven’t yet… working on it, though! I have to order more ingredients, and then the first step will be to see if I can re-create the red colour. Then, time to start experimenting! If you add milk to lye solution that isn’t cooled (iced) the milk/lye solution turns yellow or red depending on how hot the milk gets… It caramelizes the sugars in the milk… Burnt milk… Giving a red color… As your milk was powdered spread through the soap the lye probably still got to it adding to the color…. Just a stab in the dark… Beautiful soap! We had a similar experience a couple days ago. Our soap turned out a little more orange than yours, but still an amazing color. There are only a few things in common in our recipes. We used 6 pounds of oil, equal amounts of coconut oil, rice bran oil and vegetable shortening. We added ½ oz of cinnamon cassia oil from NOW Essential Oils as well as 1.25 oz (total) of several other essential oils, supper fatting with a total of about 5% with the rest made up of sweet almond oil and sunflower oil. We used powdered buttermilk instead of the whole milk you used. Our soaps always turn from a cream color to a clear red color and then back to cream once they are in the mold. It usually takes 15 minutes or so to start to turn color and then by an hour or two it’s back to cream color. This soap started turning red about a minute after we added the super fatting and essential oils, it definitely was not instant when we added the cinnamon oil so it was some sort of reaction. Once in the mold it turned darker red and the color never went away. When I pulled it out of the mold the next day it had a layer of reddish oil on the bottom, which is unusual, but the bars look good today. Also we made one other batch the same day, 2 the day before and 4 yesterday and all the others worked fine, none with cinnamon oil. It’s the first time we’ve used Cinnamon oil and I hope we can reproduce it because the color is fantastic. I’d be happy to send you some pictures if you are interested. Awesome! I love all this discussion 😀 After reading all the comments here it sounds like it is the cinnamon EO/milk combo. I have made soap with just cinnamon EO and no milk and it didn’t shift colours at all. However, I used Cinnamon Bark essential oil (Cinnamomun cassia blume), and you used Cassia (Cinnamomum cassia)—I suppose they must be close enough in composition to cause a similar reaction, but that might explain the colour difference? Also we didn’t use any lavender or oatmeal. WOW Thanks for sharing that! For the other batches you made, when you say “The other worked fine” – and you didn’t use cinnamon oil, do you mean fine as in they DIDN’T turn red? So I’m thinking definitely the milk has something to do with the bars turning the color into red, reacting with the cinnamon EO right? Correct, the final soap made without cinnamon oil all came out a nice cream color, no red at all. I’m not sure about the milk, maybe it’s just the cinnamon oil. 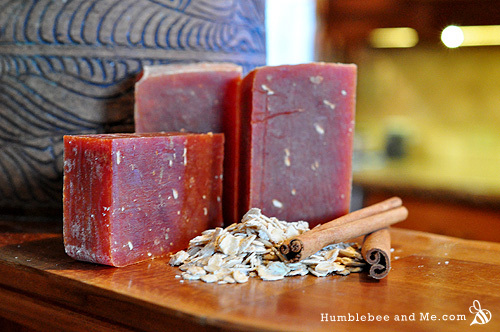 Have you ever used cinnamon oil in any other soap and at the same concentration as the red soap? We’d have to try a batch without the milk and see what happens. I was sort of hoping it was just the cinnamon oil and that we could use it in smaller amounts to color other soaps without the cinnamon sent coming through. Although it is a fairly powerful smell so that’s probably unlikely. It’d be great if just a drop or two would turn a batch red. In my experience it’s not the cinnamon EO on it’s own—I’ve made several batches of soap that contain cinnamon EO without milk, and none of them have changed colour at all. I missed it, but I guess Annie already tried it without milk, so maybe it is the combination of powdered milk and the cinnamon oil. It’ll be interesting to play around with it in future batches. I included a picture of a regular (non-red) batch still in the mold so you can see the usual color. Also there is a shot from when I removed the red one from the mold and the oil on the bottom. Awesome, thanks! What a beautiful colour. From the photos and how you mentioned that you had an unusual layer of red oil at the bottom of the mould, it sounds/looks like your soap sort of curdled a bit. I’ve had this happen a few times when using molasses or honey. The soap suddenly goes from smooth and creamy to something kind of like really runny ricotta cheese. Then, after it’s set up you have that extra oil in the mould, and the soap itself isn’t perfectly smooth like other batches (it looks a bit mottled close up). I’m still not entirely sure why this happens, but I believe it has something to do with mismatched temperatures and sugar. The soap is still perfectly fine to use, it’s just a bit more crumbly. My theory is that the oil that separates is the super fat percentage, but I obviously have no way to prove that one way or another. Anyhow, here’s a photo of a batch of my soap that split. I used honey and it REALLY split. There wasn’t a layer of fat, there was a trough of it in the top, as you can see. So sad. Still used it, though, and it ended up smelling awesome as it aged! HMMM, This sounds divine! I’m going to have to try this in the fall. I noticed that this recipe calls for lard, I wonder if it would alter the end of result it I made it with a vegetable based soap recipe. Have you tried it with a vegetable or olive oil soap version? I haven’t—you should check out my entry on using lard/tallow in soaps for some info on why I do, and possible substitutions. Yes, curdled is an appropriate description of how parts of the bottom of the soap looked, a little bumpy. It does also look a little mottled especially the bottom half of each bar which is a little lighter than the top half. Can’t wait to try it and see if it is ok. Thanks. Interesting! I should set out to figure out exactly why that happens as it is really very annoying 😛 In my experience all soaps that curdle are perfectly fine to use, and even harder than non-curdled bars, but I think they are less moisturizing. Can the lard be replaced with olive oil or coconut oil. I stumbled onto this very interesting thread while looking into home remedies for oily hair. lol. Just wanted to add to the thread that I have made cold process soap using cinnamon tea and I noticed red liquid around the soap the next day as well. I didn´t use any essential oils. It was my chef´s soap for deodorizing, that included cinnamon tea made with ground cinnamon steeped in boiling distilled water, orange rind powder, coffee grounds and the usual oils (olive, coconut, tallow, shea, castor, cocoa, and stearic acid). Thanks for sharing, Siloé! Did you use any milk in your recipe? That’s my working theory, so far at least—it’s milk + cinnamon + saponification that makes the soap turn red. Hi Marie. No I didn’t use any milk in the recipe. My soap didn’t turn into a pretty red color but rather stayed an ugly brown after I dabbed away the red liquid and allowed the soaps to cure. lol. So your theory still holds. Ok, that’s good to know. And brown soap can be pretty, right? 😛 I hope so, since I sure have a lot of it kicking around, lol. Hi, I am so wanting to make this recipe – it looks divine! But I can’t see any measurement for the milk powder? Whoops! I fixed it 🙂 Thanks for catching that. So did the cinnamon essential oil cause the color change? Or was there powdered cinnamon added to it as well? As best I can figure, it was the cinnamon essential oil in combination with the milk 🙂 I managed to duplicate this with my chai latté soap as well! Hi. The curdling soap you mentioned is called ricing. Some EO’s and FO’s will cause it to happen. If you blend/beat it into submission and pour it into the mold it comes out fine. Any soaps that have separated on me in the mold, usually from a false trace, leaving a layer of oil, I rebatch for fear of them being lye heavy. As for the cinnamon, it does need to be milk + cinnamon bark EO (cinnamomun cassia blume), not cinnamon leaf, from what I’ve observed. That sounds like a super pretty idea! How creative 🙂 I’m sorry it didn’t work out for you… it looks like it’s just that one type of cinnamon EO does the trick. It sounds super pretty regardless, though. And thank you for contributing to this experiment, lol! Hi! I love the color of this soap! Did it stay long? Or did it fade with time? I have all these ingredients and will make it tomorrow! I was just wondering if this soap held the red color after curing or if the color changed at all as time went on. The red colour has held fairly well over the last year(ish), though is has faded a bit closer to the brown side of things. It’s still very beautiful, and pretty darn cool as far as I’m concerned 😛 Your goats milk & cinnamon soap sounds just lovely, red or not. Well, it turns out that I did actually have cinnamon bark EO after all! And the soap did turn a brilliant red as well – very exciting! As the previous poster did, I did CPOP instead of just insulating, and the dark red showed up about 30 minutes into the process. I had some overflow soap that I put into a plastic container that didn’t go into the oven, and it turned dark reddish brown but didn’t gel, so it looks quite different. Interestingly, the overflow soap that didn’t gel is actually getting darker now. I guess it’s the same chemical process but just going more slowly? All of the soap is more brick colored than bright red now – it looks more like the pics of your chai latte soap. Maybe that is a difference from goat vs cow milk or fresh (frozen) vs powdered. I wish I knew! I do still like the color though. It’s so neat that it can change color without adding anything extra! That does make sense—the general consensus is the cooler the saponification, the longer it takes. It’s interesting that the colour “bricked” out so quickly, though. I used powdered cow’s milk in both of mine…. hmm. Okay Marie, do you measure the oatmeal before or after grinding? Thanks in advance! You are so inspiring! I have come up with a variation of this soap using goat milk powder and orange oil as well as the Lavender, but reversed the strength of oils. Cinnamon is more prevalent in mine. Can’t wait to pull it out of the mold tomorrow! Thanks so much, LeAnn 🙂 Aww, shucks. How does the soap look now that it’s out of the mold? It sounds lovely! Mine turned red with only olive oil, although it cured to a reddish brown. My recipe had olive oil, goat milk, honey, ground oats, cinnamon bark and clove essential oils, and vitamin e oil. It seems that cinnamon bark oil plus milk is really the key! Out of curiosity, how hard did these bars end up being? They came out pretty hard – they were brittle enough when I cut (less than 24 hours from pouring) that I couldn’t mash the end bits into balls like I usually do with other recipes. The same happened when I made the plain castile soap that I posted on your FB a while back. It was really soft, just a thin trace, when I poured it into the mold though. Hmm, interesting—and good to know! You seem to have a knack for nice, hard castile bars 🙂 I really must give that a go… I need more lye first—I just emptied a 4kg container! I used a cinnamon leaf EO. So far it has turned a rich brownish red color. Beautiful, but not like yours. Thanks! Ok sure. I will try to do that after work tonight! The soap is a pretty brown color, but definately not red like you soap is. I actually just bought some cinnamon “bark” EO just so I can try this recipe again. I’ll keep you informed. 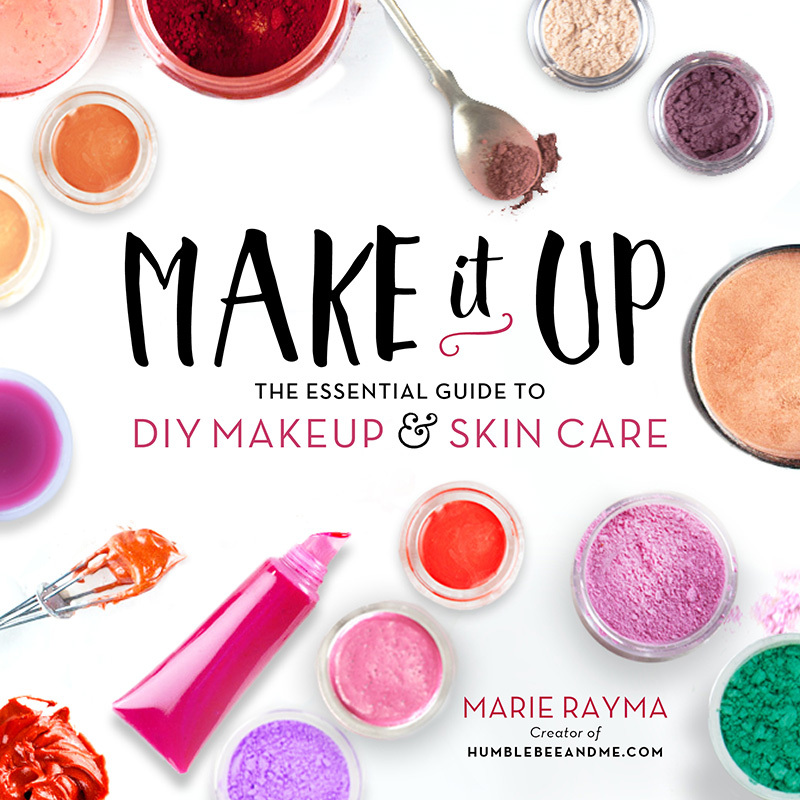 I have jumped in head first to the wonderful world of DIY this fall since my discovery of your blog! I have my first lemongrass seaweed shampoo bars curing, I daily use the Perfect Body Butter, I just cut a loaf of this cinnamon oatmeal soap, and I have goodies for bath bombs, lotion, and lip balm awaiting! I used nonfat milk powder instead of whole. I used room temperature processing and let it saponify in a very chilly basement with no insulation. I suspect it is the milk, but I cannot seem to find any other internet sources about cinnamon and milk turning soap red. If the milk fat is key, than my nonfat substitution was enough to change the color reaction! Thanks for all the inspiration! Your work is lovely! Hi Heather! Thanks so much for reading & DIYing with me 🙂 I suspect you’re right about it being the milk fat—I usually soap at room temperature, and I’ve had the red reaction without the lavender EO as well. I wonder if perhaps the powdered nature of the milk is important as well… hmmm. 1. What temps did you use when you combined the lye mixture with the oil mixture? 2. I can’t find Oat Oil around me…can I use Sunflower or Walnut Oil instead? The SAP’s are the same as Oat Oil. I am so intrigued by the red soap – I intend to get my hands on some cinnamon bark EO (I’ve currently only got cinnamon leaf) and experiment. Thanks!! I have a fondness for rustic looking soaps, and this one is one has been on my to do list for quite some time. Unfortunately, mine did not have the gorgeous, rich red tones that yours has. Will probably try again using nda cinnamon bark eo. This was the first time I’ve soaped with powdered milk-have you tried using amounts greater than one tablespoon? I love the feel of gm soap, but my experience w/ fresh gm has always resulted in an intense goaty smell, that I can still detect even after curing. Am wondering if I can get away with using double or triple that amount without ruining the batch. Thanks for sharing! I’m afraid I can’t see the link you sent me as I don’t have permission to, but you are more than welcome to share the photo on the Humblebee & Me facebook page—I’d love to see it! Hmm, that is very odd! It definitely should not be that soft. Since it sounds like the only big variable in there is the fragrance oil I’m wondering if that’s the culprit, though usually fragrance oils make soaps trace faster and harder if anything, not the other way around! Is there any chance you accidentally used way too much water? Or not enough lye? In any event it should harden up nicely, it might just take a while! this scent combination is one I would never have thought to pair but it is lovely. The lavender calms the cinnamon into submission for a lovely warm scent. But I want the red. Lol. Any and all tips welcome, as I will be trying this again soon. Hmm, how interesting; I wonder if the composition of goats milk is different enough from that of cows milk to cause the difference? Goats milk does contain less lactose, so if it is the lactose that is reacting, that could explain why you got partway there, but not all the way? Hmmmmmmm. So I was purposely tried to recreate this red color so I followed the recipe closely with only a couple of substitutions. I substituted avocado oil for the oat oil, since I didn’t have oat oil and I used powdered coconut milk instead of regular milk powder. I added the clay, oats and milk powder to the lye water before mixing with the oils. It took a while to come to trace. My bars turned out a beige cream. They are lovely but I’m bummed that I didn’t get the red color. Tried this recipe with slight variations. Didn’t have cinnamon bark only had cassia but I still got a reddish brown colour. The soap smells heavenly, can’t wait to try it out. Thanks for the inspiration. Do you think it would turn red if using the hot process method? I’m not sure, I’ve probably made hot process soap twice. Given the EOs are usually added after the cook you may not get the same chemical reaction. Can I use ____________ instead of _____________ in a recipe?